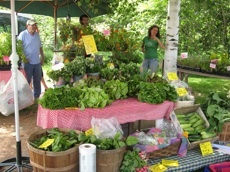 The Stowe Farmers Market is open every Sunday starting May 16th through October 17th from 10:30AM - 3PM rain or shine. The Stowe Farmers Market offers an array of fresh produce, local crafts and prepared foods. Whether you're in the mood for Asian or BBQ, you will find it here. Not only is the farmers market a great place to pick up locally grown produce for the week, it also offers entertainment with live music. It's a great way to spend a few hours with the kids outside on a warm summer or fall day. Your kids can even enjoy a horseback ride while you're there. The Stowe Farmers Market is located right off the Mountain Road in the field next to the Red Barn shops, directly across from the Stoweflake.